While a couple hundred people traveling in a migrant “caravan” from Central America were planning to seek asylum in the United States Sunday, Customs and Border Protection officials said the San Ysidro Port of Entry is at capacity for people without documentation. “Depending upon port circumstances at the time of arrival, those individuals may need to wait in Mexico as CBP officers work to process those already within our facilities,” CBP Commissioner Kevin McAleenan said in a statement. “As sufficient space and resources become available, CBP officers will be able to take additional individuals into the port for processing. “CBP will communicate with Mexican authorities for operational awareness on this issue of capacity within CBP facilities as appropriate,” he added. Earlier in the day, some of the caravan travelers — many of whom say they’re fleeing violence in their home countries — were at a cross-border rally 6 miles west of the port of entry. 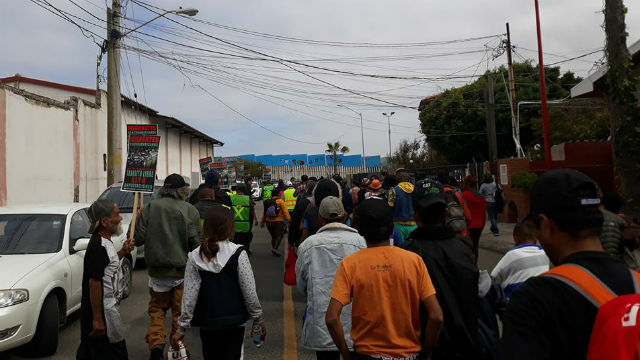 The refugees milled about at Playas de Tijuana on the Mexican side of the fence near its terminus at the Pacific Ocean. North of the fence, another 50 supporters rallied in Friendship Park, at the southern end of the United States’ Pacific Coast. Some supporters of the caravan scaled the border fence, apparently clamoring up from the Mexican side, although no one attempted to cross north into the United States. Over the weekend, they’ve been engaging in legal orientation sessions to understand their rights and what to expect at the U.S. entrance, the Times reported. In San Diego on Saturday, a group of demonstrators marched from Balboa Park to Chicano Park. The caravan has been making national headlines for the past month after catching the attention of President Donald Trump. It first began with about 1,000 people March 25 in the Mexican city of Tapachula, near the Guatemala border, drawing comments from Trump as evidence of what he and his aides portrayed as a significant threat, the Post reported. In the intervening month, the caravan migrants’ numbers have dwindled significantly. Customs and Border Protection officials said on Saturday that some of the migrants in the caravan had tried to cross the border near San Ysidro since Friday. No estimate was given on the number of border-crossing attempts that had taken place. Scott said it was “unconscionable” that children were being smuggled into the country in what he referred to as dangerous conditions. In the statement, he warned the remaining caravan members to follow the law. “If anyone has encouraged you to illegally enter the United States, or make any false statements to U.S. government officials, they are giving you bad advice and they are placing you and your family at risk,” he said.